Special Containment Procedures: None needed. Object is stored in Dr. L██████s desk. Object is to be locked in one of Site 62's secure lockers. SCP-573 requires the agreement of two members of Senior Staff in order to be removed from containment. No one is allowed to make use of SCP-573 without at least two back-up researchers. Testing of SCP-573 around children is hereby denied without O5 approval. 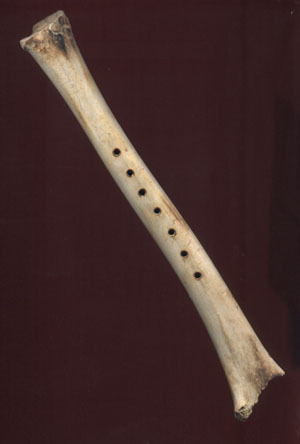 Description: SCP-573 is a flute made from bone. DNA and carbon testing reveal the material to be human, female, and approximately a thousand years old. The bone is a femur, and, from the size, comes from a child between the ages of seven and twelve. SCP-573 was discovered in ███████████████, Louisiana, by agents investigating the disappearance of local children. Agents arriving on the scene were attacked by a pack of wild animals, several different species working together. Once the animals were put down, the agents were then attacked by several of the missing children, being urged on by one Darald King, the then-owner of SCP-573. Agent ███ shot Mr. King, ending his hold over the children and preventing a major incident. Testing of SCP-573 has revealed that, when played, it places animals and prepubescent children into a highly receptive state. All creatures so affected are eager and willing to do whatever the player requests, including things that are beyond them when in a non-trance state. Once the instrument is played, subjects remain in the trance state for five times the period the flute was played for (e.g. play the flute for a minute, the trance remains for five minutes). Knowledge of how to play a flute is not needed to effectively use SCP-573. Anyone attempting to use SCP-573 will find themselves able to play the flute as if they had been playing for years, and can play any song they desire.